← Poll: With VP rumors flying – Who do you like? Christopher Hitchens is an interesting sort. I first saw him on the panel of Real Time with Bill Maher. He comes off as pompous and arrogant and the immediate impression is to despise him. Initially, I dreaded hearing that he would be on an upcoming show. I’m not quite sure if it was his political positions or his on-screen personality that I first found irritating. As Bush’s approval shrank, I seemingly found myself more aligned with Hitchens’s opinions – or his with mine. His 2007 bestseller, God Is Not Great: How Religion Poisons Everything, really put the atheist’s position into clear terms, though I’m not quite sure with how much of it I agree. 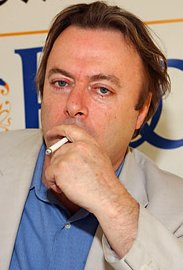 One thing is certain, whether you agree with him or not, Hitchens makes you think. Recently, Hitchens went to a whole new level. For the sake of journalism, he was waterboarded. Yes, you read correctly. Christopher Hitchens – at 59 years of age – for a piece in Vanity Fair – was waterboarded. He describes, as only Hichens can, the experience, combining the torture with humor. To read the full Christopher Hitchens story in Vanity Fair, click here.